* Decreases system power reduction events due to single-module shading. * Incremental system growth capability - no need to purchase many expensive modules at one time. their associated costs and installation time. * Improved reliability - single inverter failure does not disable entire system. The module performance information generated by each Micro-inverter is collected by the Enphase communications gateway called the Energy Management Unit (EMU). 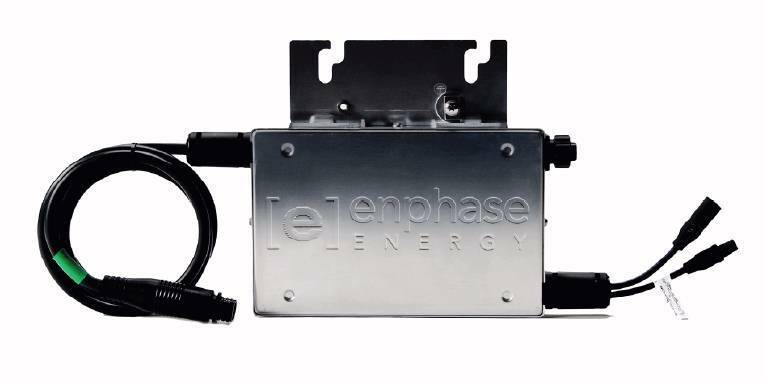 The EMU then transmits this data over a broadband internet connection to the Enphase Enlighten™ website. Dimensions (WxHxD) in inches 8.0" x 5,25" x 1.25" 8.0" x 5,25" x 1.25"
Note that the 208V version is only suitable for use on one leg of a 3 phase 120/208V power system. To predict how much electricity this system will generate in your area (with the corresponding reduction in your utility bill usage) go to the bottom of our Array Sizing Worksheet.